“Hawaiian Sunset” photo tour not only positions you in perfect timing to capture a brilliant sunset. Be humbled by the great topography of Hanauma Bay. Be nourished by the fresh air of calmness, and carry this excited state forward for the remaining of the day as you encounter the smells of hundreds of Plumeria flowers at a botanical garden in a volcanic crater. Then, the Ko’olau Mountains up close and personal at the Makapu'u Lookout. Please the senses at Ai Love Nalo or Ono Steak & Shrimp, each specializes in Hawaiian and Hawaii-inspired dishes. Continue to the Halona blow-hole to capture the stunning landscape of East Oahu. You’ll get the chance to see tide pools, late stage volcanic eruptions. Be prepared to capture vibrant blue waves crashing into unique rock formations in the world! Oahu Photography Tours’ Epic Sunset Island Tour not only positions you in perfect timing to capture brilliant colors of a Hawaiian sunset, but you get to take pictures of the sun-rays as they touch and graze the topography of Oahu Island’s Windward side. The cool breezes on top of mountains, calming effects of a Buddhist temple, delicious local food not found in Waikiki, paragliders flying over lighthouses, and sea cliffs on the water’s edge will have you saying “I never want to leave Hawaii” after this tour. Begin your journey high above the clear waters of Hanauma Bay. Then, drive to the Lana'i look out. The blue colors of the Kawai channel are both breathtaking and overwhelming. Depending on eh time of year, you may spot the Hawaiian born Humped-backed whale. A pull back into Koko Crater Botanical garden is next on the list. Beautiful and intricate grooves of Plumeria will have you stopping to smell and photograph these bright tropical flowers. The spirit of this location is pleasing and benefits all visitors with a sense of inner peace, serenity, and of course by providing the gift of beautiful images. Centered and inspired, you’ll be brought up close and personal with the Ko’olau Mountains at the Makapu'u lookout for an unforgettable experience with this Nationally protected landscape. You’ll understand why this location was designated as a National Natural Landmark in 1972 because preserving the pure quality of this natural feat is worth appreciating. Anyone looking for memorable things to do in Oahu will feel the value in sharing space with the majestic Ko’olau Mountains. After all of the excitement, the Hawaiian Sunset Island Tour will take a break to satisfy our appetites at Ai Love Nalo or Ono Steaks & Shrimp, which specializes in Hawaiian and Hawaii-inspired dishes. All meals are served with locally produced and health conscious ingredients. Let's watch the Halona Blow spout off while our delicious food settles in our bellies. We could be super lucky to see the water shoot up over our heads at this movie location and favorite photo spot. 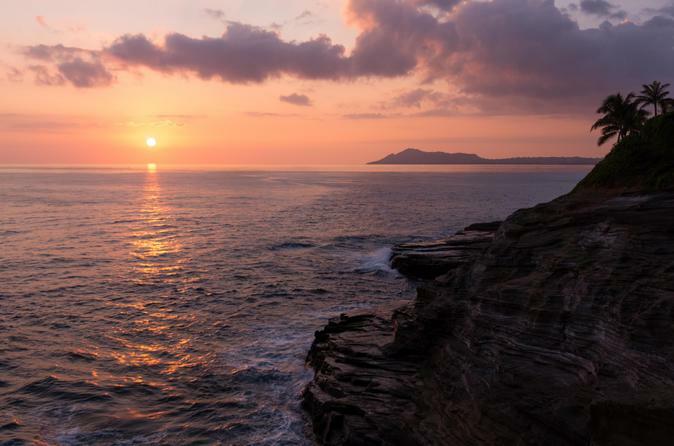 After snapping the shots of the Blow Hole and Eternity Beach, we’ll prepare to photograph Hawaii’s most epic sunset on the Eastern tip of Oahu, where you’ll capture the sun dropping down the sky along the sea cliff walls. This beauty can only be witnessed by you and you alone, on our Hawaii Sunset Tour.